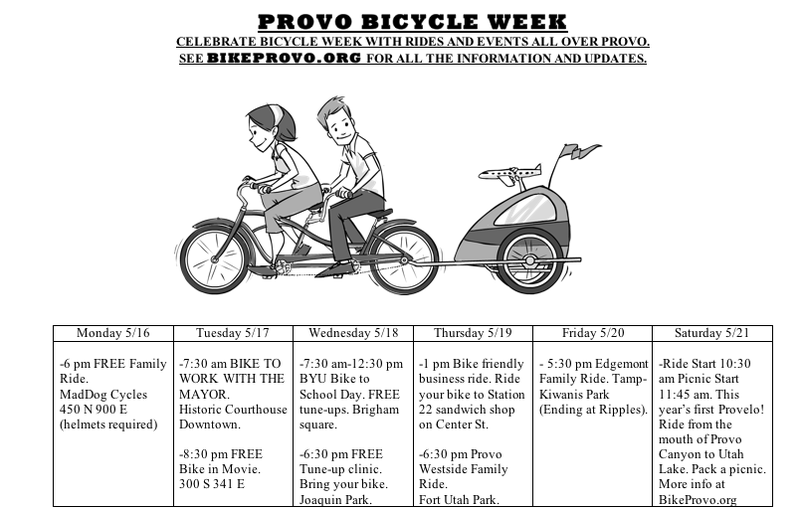 Over the last week we have been working hard to compile all the bicycle events that will be going on next week for the Provo Bicycle Week (5/16-5/21). We finally have almost all of the times and places nailed down. We are going to give you all the information that we have now, but make sure to keep swinging by this week and next for updates and additions. Tuesday: 7:30am BIKE TO WORK WITH THE MAYOR. Downtown Historic Courthouse. Wednesday: 7:30am-12:30pm BYU Bike To School Day. FREE Tune-ups. Brigham Square. -6:30pm FREE Bicycle Tune-up Clinic. Joaquin Park. (Bring your bike). Thursday: 1pm Bike Friendly Business Ride. Ride your bike to Station 22 Sandwich Shop on Center St.
-6:30pm Provo Westside Family Ride. Meet up at Fort Utah Park. Saturday: This years first Provelo! Bike Ride from the mouth of Provo Canyon to Utah Lake. The ride will start at 10:30 am. At the end of the ride (UT Lake) there will be a picnic. Like all Provelos make sure to pack some food to share or for your self. Along the ride the group will be stopping at certain spots to collect any riders who do not want to do the whole ride. More information to come. This looks like a pretty full week of awesomeness. There is something for everyone. Feel free to print off the image at the top of the post and pass it out. Make sure to put this up on your Facebook, Twitter, Blog, Tumblr, or what ever it is the cool kids are doing today. All of these rides and groups have put work into these rides and would love to have you there. Also it should be noted this is not everything. There are still a few rides and events we are hunting down. When we have all the information we will update you so make sure to swing by often the next two weeks. This entry was posted in Kids and Family Cycling, Local Biking Events, University Bike Scene by Zac. Bookmark the permalink. What year are you guys in? Your dates are all wrong. It should be May 14th – May 19th. I’m excited to go on some fun rides though!